A jewel of greenery on the Côte d'Emeraude (Emerald Coast). 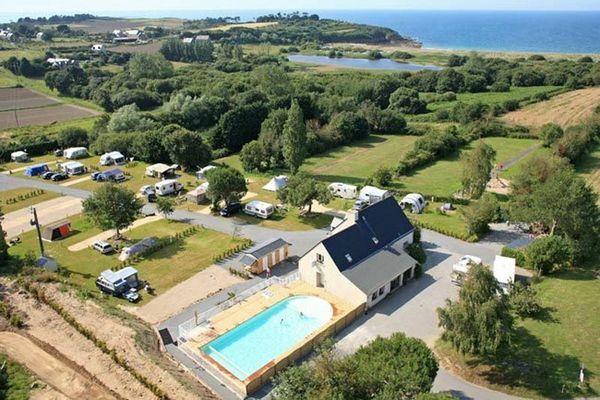 The camping Notre-Dame du Verger located between the Pointe du Grouin and Saint-Malo is a delightful site to be savoured, located just 400m from a superb beach. You shouldn't be too surprised to find a pearl of an outdoor holiday park just 3km from Cancal's oyster farms! The fifty or so plots sit here peacefully season after season, far from the asphalt and the crowds. This is an idyllic setting and includes a heated pool, a bar that serves snacks, and a games area, all contributing to the relaxed and friendly atmosphere. A walkers' path leads directly to a beautiful beach of fine sand, fringed by an emerald sea. Hiking and walking enthusiasts will be pleased to see that the GR34 leads to other creeks and rock structures, and if you’re keen on walking then Cancale is just 6km away. The panoramic views are stunning, with the Mont Saint-Michel strikingly visible in the middle of the bay.